Immerse yourself in the quintessential culture of England on a half-day Viator Exclusive tour that can’t be booked anywhere else. First, indulge your palate at the Riverside Rooms, an elegant restaurant renowned for its afternoon tea. While you enjoy views of iconic London attractions such as Big Ben and the Houses of Parliament, nibble on finger sandwiches, cakes and fruit scones smothered with Cornish clotted cream. Then, use your skip-the-line ticket to sail past long lines for the London Eye and absorb panoramic vistas of London as you rotate. After making your own way to London’s vibrant Southbank area, you’ll head inside the Riverside Rooms to begin your quintessential English expereince. Drink in the elegant décor of the restaurant — renowned for its classic cuisine and views of London — and take a seat at your beautifully laid table. Delight in an enticing array of dainty finger sandwiches and sweet treats while sipping English tea and enjoying the oak paneling and parquet flooring of the restaurant. Smother fruit scones in strawberry jam and Cornish clotted cream, and scour the horizon for iconic landmarks such as Big Ben and the Houses of Parliament. Once you’re suitably sated, you’ll stroll to the London Eye and glide past long lines with your skip-the-line admission ticket. Board a comfortable pod and absorb panoramic vistas of the English capital as the wheel completes a leisurely rotation and reaches a height of 422 feet (135 meters). 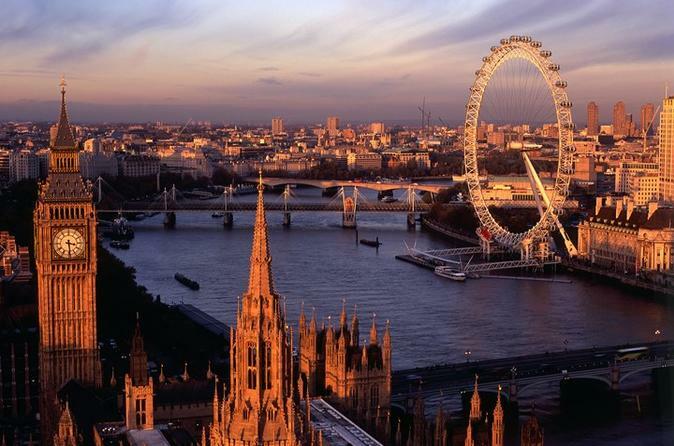 After one rotation, disembark the wheel and continue exploring London independently.